Steam's In-Home Streaming feature is now out of beta, allowing any users on Valve's PC distribution service to stream games between two computers on the same network. This means you can plop a high-end gaming PC in one room and let it handle all the heavy-duty work while you stream games to your laptop. Or, theoretically, you could get a cheap Steam Machine to run games on your TV while your bulky gaming PC sits in the office, doing its thing. 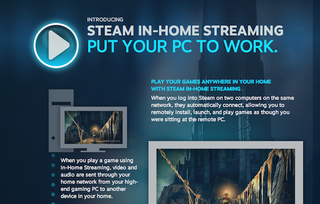 Valve's got a hub page for In-Home streaming right here.